Over Christmas break I really started to get back into using my Atari 800xl. I got my MyIDE+Flash set up to work with Action! because I've always wanted to learn it. Then I read about the BASIC Ten-Liners - Contest 2014. 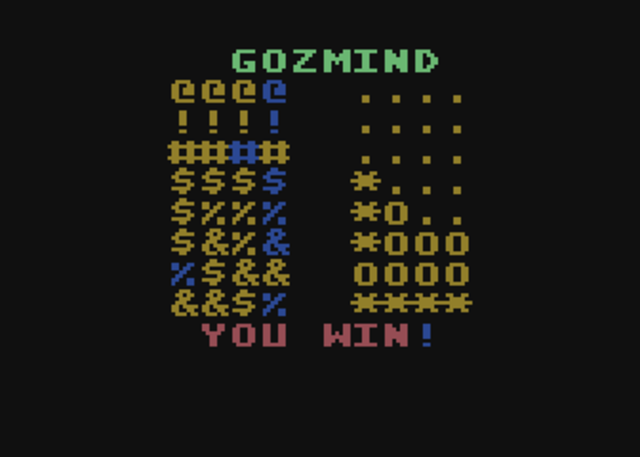 I had a snow day today, so I am proud to announce GozMind. It's basically a clone of Mastermind. Unfortunately, trying to fit it into 10 lines was tough. So tough that the code to guess consists of the built in characters, *[email protected]#$%&. After you enter your guess with the controller, pressing the fire button will have the computer tell you how you did. An * means you have the right character in the right place. An O means that you have the right character, it's just in the wrong place. This is my favorite line of the program. To create a random code to guess, the program randomly picks a number from 0 to 1295. Why 1295? That is 5555 is base 6. We have 6 codes from which to select, so we want to use base 6. Once a random number is selected, it is converted to base 6. Since strings in Atari Basic start with one, we have to add one to each character. Each digit is converted to a string and then place in S$. The graphics mode is selected and GOZMIND is printed at the top. player. C is the current character the player is working on. POSITION 5,Y:? #6;O$;" ";A$: Print the current guess (O$). A$ will be the what characters are right, once the player makes a complete guess. Reads the joystick, and adjusts the variables related to the current code and position. If statements are used to keep the values in range. It adjusts the character in G$ depending on what the player has selected. The repeat loop is waiting for a guess in all 4 slots and for the player to push the button. Once satisfied, execute the SOLVE procedure. Prints how well the player did on the right side of the screen. It them increments Y to go to the next row and checks to see if the player has solved the puzzle yet or if the player has exhausted all 10 tries. If the game has ended, wait until the player to press the button to start a new game. Else, continue playing. Converts the numbers in G$ to the characters to print on the screen. The computer only deals with numbers, but we need to covert to characters for the player. The toughest code to write. O$ is a copy of the solution, because we are going to destroy the variable as we go. First it finds out which character selected by the player is correct and in the correct place. The for loop goes through each character of the solution, and checks for a match in the players guess. If there is a correct guess, the current position of A$ is set to * and the position has one added. We then set that position in O$ to a . and in the guess to space so it doesn't match any further. The code then goes through the solution one character at a time and checks for the right character just in the wrong position. This time, if there is a match, it is added as an O to A$.